Hypnosis has been shown to be effective for smoking cessation. A study conducted by the American Lung Association of Ohio showed positive results from a single hypnotherapy session. Over 2,800 smokers participated in this study. Participants were contacted one month after the hypnotherapy session and asked to report their progress. Over 20% of the participants reported not smoking at all in the month following the hypnotherapy session (Ahijevych, K., et al., 2008). Ahijevych, K., Yerardl, R., & Nedilsky, N. (2000). Descriptive outcomes of the American Lung Association of Ohio hypnotherapy smoking cessation program. International Journal of Clinical and Experimental Hypnosis, 48(4), 374-387. 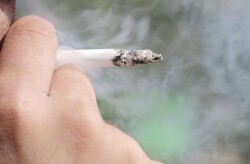 Hypnosis was found to be an effective therapy for smoking cessation. The subjects in this study participated in either hypnosis or behavioral counseling in order to quit smoking. The participants were then interviewed six and twelve months after their respective treatments. The study showed that the hypnosis participants experienced a significantly greater success rate than the behavioral counseling participants (Carmody, T., et al., 2007). 3 Times the Effectiveness of the Patch and 15 Times More Effective than Willpower Alone. According to the largest ever scientific comparison of ways of breaking the habit. A meta-analysis, statistically combining results of more than 600 studies of 72 000 people from America and Europe to compare various methods of quitting. On average – hypnosis was over three times as effective as nicotine replacement methods and 15 times as effective as trying to quit alone. Study of 71 smokers showed that after a two-year follow up, patients that quit with hypnosis were twice as likely to still be smoke-free than those who quit on their own. Guided health imagery for smoking cessation and long-term abstinence. Wynd, C.A. Journal of Nursing Scholarship, 2005; 37:3, pages 245-250. © 2009 William H. Horton. 86% of the men and 87% of the women reported continued abstinence using hypnosis. Performance by gender in a stop-smoking program combining hypnosis and aversion. Johnson, D.L. and Karkut, R.T. Adkar Associates, Inc., Bloomington, Indiana. Psychol Rep. 1994 Oct; 75(2):851-7. Clinical hypnosis for smoking cessation: preliminary results of a three-session intervention. Elkins, G.R. and Rajab, M.H. Texas A&M University, System Health Science Center College of Medicine, USA. Journal of Clinical and Experimental Hypnosis. 2004 Jan; 52(1):73-81. Group hypnosis, evaluated at a less effective success rate than individualized hypnosis (at 22%). However, still demonstrated here as more effective than drug interventions. Descriptive outcomes of the American Lung Association of Ohio hypnotherapy smoking cessation program. Ahijevych, K; Yerardi, R and Nedilsky, N. Ohio State University, College of Nursing, Columbus 43210, USA. Hospitalized patients who smoke may be more likely to quit smoking through the use of hypnotherapy than patients using other smoking cessation methods. A new study* shows that smoking patients who participated in one hypnotherapy session were more likely to be nonsmokers at 6 months compared with patients using nicotine replacement therapy (NRT) alone or patients who quit “cold turkey”. The study also shows that patients admitted to the hospital with a cardiac diagnosis are three times more likely to quit smoking at 6 months than patients admitted with a pulmonary diagnosis. Dr. Hasan and colleagues from North Shore Medical Center and Massachusetts General Hospital compared the quit rates of 67 smoking patients hospitalized with a cardiopulmonary diagnosis. All patients were approached about smoking cessation and all included in the study were patients who expressed a desire to quit smoking. At discharge, patients were divided into four groups based on their preferred method of smoking cessation treatment: hypnotherapy (n=14), NRT (n=19), NRT and hypnotherapy (n=18), and a group of controls who preferred to quit “cold turkey” (n=16). All patients received self-help brochures. The control group received brief counseling, but other groups received intensive counseling, free supply of NRT and/or a free hypnotherapy session within 7 days of discharge, as well as follow up telephone calls at 1, 2, 4, 8, 12, and 26 weeks after discharge. Patients receiving hypnotherapy also were taught to do self-hypnosis and were given tapes to play at the end of the session. The researchers note that hospitalization is an important opportunity to intervene among patients who smoke.